Well, in the imperfect life that is school administration, my Tech Tuesday turned into a Tech Friday, but I was just glad to be able to get it on the schedule, regardless of the day! This week, I aimed to provide a quality resource (or curation of resources) to teachers about student blogging. In my lesson, I make the case for blogging, and some really awesome “side effects” blogging can have for students. I referred to an article by George Couros where he does an excellent job of explaining why students should blog. I then linked up a bunch of resources and examples of student blogging, followed by four (free!) platforms that make the process pretty easy. Don’t get me wrong – there is quite a bit of work to get started with student blogging, but using the right tools can help the process become easier. I hope you enjoy the lesson on student blogging! Thanks for reading! Click here to access the lesson on student blogging. The Kansas City Royals won the World Series. The Kansas City Royals are World Champs. The Kansas City Royals took the crown. I still can’t believe those statements are true. It’s like we’ve been living in a dream for the past few days, and we haven’t woken up yet. For the Royals fans in this household, we’ve been waiting for this moment, well, for a lifetime. And oh how sweet it is. Let’s all just sit here for a moment and take it all in. What a season. What a team. I think something that speaks volumes to what this means to us as a collective city (yes I’m including the suburbs as part of the “city”) is that several area school districts canceled school today for the celebration parade and pep rally in downtown KCMO. How special for those that were able to attend! Needless to say, our city is electric with Royals fever right now. So why am I writing about this championship team in my school blog? It’s easy – this team exudes qualities of what it takes to be successful, so I want to talk about a few of them. Let’s start with the obvious. 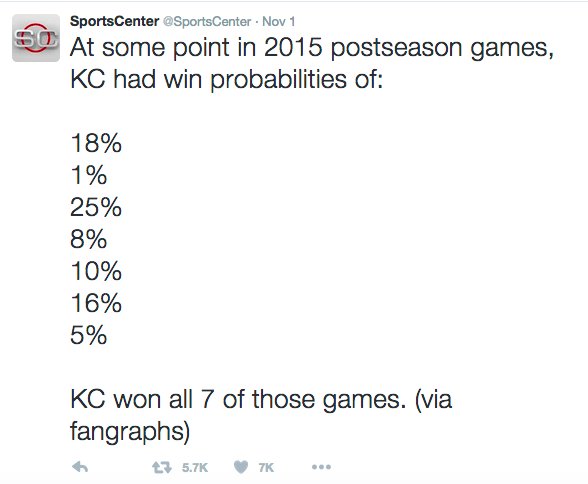 These Kansas City Royals are resilient. Let’s walk through some of the most notable comebacks of the postseason. We’re going to start with the game where we had a 1% chance to win. Let’s go all the way back to the ALDS Game 4 against a very solid Houston Astros team, and we were facing elimination. If we lost, we were done. We were losing 3-2 going into the bottom of the 7th inning (did I mention we were in Houston?). The Astros then knocked in three runs off of two home runs to extend their lead to 6-2 in the 7th inning. It was looking dismal at best. The very next inning, something special happened. We kicked, clawed, scratched our way back into the game, and scored 5 runs off of 5 hits. (Sometime I’ll have to tell you about my crazy superstitions during post season baseball. Let’s just say once we scored the first run of the 8th inning, I was sitting in my car in a parking lot listening to the radio for approximately 45 minutes.) We ended up winning the game, forcing a Game 5, which we won in a come from behind fashion as well to move on to the American League Championship Series. Fast forward a bit to Game 2 of the ALCS against a very, very good Toronto team. We were losing by 3 going into the 7th inning. And then it happened. Again. The comeback kids scored 5 runs in the 7th inning, which would end up being enough to win the game before the series went across the border to Canada. (I was at Power and Light for this game – you want to talk about a place that went from semi depressed to electric in the blink of an eye?!) Anyway, point is – we were in a tough spot, and we found a way out of it. We can’t talk about epic comebacks without talking about Game 1 of the World Series. Fourteen innings of pure stress and excitement rolled into one baseball game. (Side note: The post season really has an effect on my sleep – I was running on fumes the next day, like most of Kansas City.) Anyway, the Royals were losing going into the bottom of the 9th inning. We were up against Familia, the Mets’ closer who was known for getting the job done, and who had been solid all throughout the postseason. Then Alex Gordon (my favorite Royal) steps up to the plate and BLASTS one out of the park. All of a sudden we’re in extra innings, and in the bottom of the 14th, Hosmer hits a walk off sacrifice fly ball. Royals win, beating the odds. The last one we will talk about is the game that clinched the World Series. The Mets’ pitcher had pitched LIGHTS OUT all game. “The Dark Knight” (Matt Harvey) was shutting us down. It looked inevitable that the series would return to Kansas City for a game 6. We were losing 2-0 in the ninth! The ninth! Then out of nowhere, the Mets make a mistake or two, we capitalize on it, take some risks, and tie the game. We force extra innings, and end up taking the series on a 7-2 win in twelve innings (Thank you Christian Colon!). Is that incredible or is it incredible? If you listen to any interviews by the Royals about their ability to come back, they’ll all give you a similar message – we know how to play when our backs are against the wall. We know how to handle tough situations. We know how to work through adversity. We stay focused on the task at hand, and we find a way to get it done. No excuses. We just get it done. We believe in ourselves. We believe in our teammates. There’s no pouting or complaining – we have a job to do, so we do it. Take away the context of baseball for a second, and replace it with the context of school, teaching, and learning. Isn’t this what we want of our students? Of our teachers? Of our administrators? Resiliency is a skill. It’s a skill that is taught. Everyone is going to face hard situations in life. How do you handle that hard situation? You’d be well advised to take a lesson from our Boys in Blue. Let’s now re-visit Game 5 of the World Series. You know the one. Yeah, the one where we WON THE WORLD SERIES! (Sorry, it’s still pretty fresh.) Remember, we were losing 2-0 going into the ninth inning. We scored 1 run to close the lead to 2-1, and then Eric Hosmer was at 3rd base. Salvador Perez was up to bat. There’s a ground ball hit to the left side. Third baseman David Wright fields the ball. He checks Hosmer at 3rd, then makes the throw to first. AS SOON AS Wright throws the ball, Hosmer breaks for home. Lucas Duda (Mets first baseman) makes a throw home, but it’s off the mark, Hosmer scores, tying up the game. This was a huge risk for Hosmer to take. With a good throw, there’s a high possibility that he would have been out, and the game would have been over. But, his gut told him to take the risk, he did, and it paid off… big time. Without that risk, it’s very possible we don’t score again that inning, and the Met’s force a game 6. You see, for Hosmer, the possibility of tying the game in the bottom of the ninth outweighed the “safe choice” by a landslide. So it is too, in education. We are always faced with new challenges. New obstacles. New expectations. Sometimes, embracing all the “new” comes with a huge risk. The risk and fear of the unknown. Did Hosmer know he was going to be safe? Absolutely not. Do you know as an educator if trying something new is going to work like you envision? No, we don’t always have that foresight. But hopefully that doesn’t stop us from trying. Hopefully, we can see that the benefits of engaging more students and trying something new and innovative outweighs the safe choice of “this is how I’ve always done it, and it’s just fine the way it is.” Great teachers take risks to try new things to make their classrooms student-centered, rigorous, and, well, fun. If you look at any of these come from behind wins, you can probably point out at least one mistake that our boys made that led us to the aforementioned deficit. Here’s another thing that’s special about our team: They rally behind each other. When someone is having a rough outing, they let them know “Hey man, we got you.” For example, when Ryan Madson gave up the 3 runs to the Astros in game 4 of the ALDS (remember, Royals were facing elimination), his teammates came up to him and said, “We got you. Don’t worry. It’s not ending like this.” When three of our players lost parents during the season, their teammates picked them up, supported them, and helped them through a hard time. These guys go past your typical “teammate” relationship. They have entered into what seems to be a brotherhood of sorts. A special bond that they’ll always share. How important is it in education for us to do the same for one another? Collaboration is key to fostering a growth mindset among our teachers. We can support one another, learn from one another, pick each other up, help each other out – we are a family. Just like the Royals had one goal that united them and made them fight together to keep the line moving, so do we as educators. Our goal is student success. If we can support each other to accomplish and achieve our goal, we are one step closer to being Royally successful. What can you do to foster the same type of spirit in your school with your students and your staff? Before Tech Tuesday this week, I sent out a survey to staff asking which type of professional development they were most interested in. The choices were “Alternative tools for student presentations (besides Google Slides and PowerPoint),” “Teacher tools for organizing your digital life,” and “Digital Storytelling.” I wanted to be sure that I was presenting on topics that the staff wanted to learn about, and this survey would help me determine the priority of the professional development that teachers wanted. As it turns out, all three were tied in interest level almost all the way through. At the end, Digital Storytelling barely prevailed, and I was very excited at the thought of putting together professional development for this. And then, I Googled it. If you ever want to be overwhelmed by resources, you should try Googling “Digital Storytelling” sometime. It was tough to know where to start. Luckily, I had recently made a connection with the educational technologist that is now at a school where I used to teach. She had recently completed a large project for a master’s class on Digital Storytelling, so her resources provided me with a FANTASTIC starting point. I then got on Twitter, because if I ever need a bunch of GOOD curated information, I head on over to @cybraryman1’s website (cybraryman.com) and I know I will find a ton of excellent resources. So using these two platforms as my launching pad for research, I knew I was in good hands. Thank you, thank you, thank you, to my PLN and all of the interwebs for your resources. When I taught, I cannot say that I used a ton of digital storytelling in my classroom, but I did use the heck out of GoAnimate (back in the day where you could do some cool stuff for free) for some funny Spanish videos with my students (hey, all that matters is if I thought they were funny, right?). And that was about the extent of my knowledge on digital storytelling. So, I knew I had quite a bit of work to do when it came to this professional development. I needed to get to know the ins and outs of digital storytelling in about a week. What better way to get to know it than to start making a few videos?? But what do I make a video about? The obvious choice is to make a video about my daughter (which I did), but I knew I would need something a little more powerful. Something that came from…. the students. So I talked with our video production teacher to see if I could borrow a few of his students in his upper level video class to be in my video. I asked them a bunch of candid questions about storytelling and why it’s important, and how technology helps them tell their stories. I was blown away by their responses. Check them out! Must Haves: Text, a close-up shot, and a spoon. I’m a sucker for competition, so I made my second video for Tech Tuesday. Check it out! Through this competition, I was able to include mobile storytelling in my presentation for both Apple and Android devices. All three offer slightly different types of stories to be produced, based on teacher preference and comfort level with each one. I finished my presentation with curricular ideas for implementation, to get some creative juices flowing for teachers. What digital storytelling lessons to you incorporate in your classroom, or what ideas do you have for future use? I’d love to hear them! In the meantime, below is my presentation that I used during Tech Tuesday today! I hope you can find something useful out of it! Thanks for reading! Good Tuesday evening to you! I apologize in the lack of blog posts lately. I could give you a myriad of excuses, but nobody wants to hear that, so onward we go. Anyway, I hope you enjoy the lesson, and can find something useful out of it as an educator. Ok, Ok, I say those things in jest (kind of). But honestly, technology, as wondrous as it is, can cause people some headaches (including me from time to time!). Especially teachers. It’s always changing. There are always new things to learn. It’s hard to keep up! You try something, and it doesn’t work out quite the way you envisioned, so you slowly start to write technology off altogether. After all, we’ve gone all these years teaching students without the latest and greatest technology – if it’s not broke, don’t fix it! Right? I truly feel that if we don’t incorporate technology into our lesson plans, we are doing our students a disservice. Ok, let me back up just a second. I should probably define what I mean by “incorporate technology.” I think technology has two distinct roles in education. 1) To make teacher’s lives easier. (Think online formative assessments, grading made easy, analyzing data, etc.) That’s a really awesome role that technology can play. and 2) To engage students in higher order thinking skills, make them creators of digital content, and prepare them for life in a digital society. Please know that for this post, I’ll be referring to the latter, although I do love the former as well. Ok, so back to my point: If we don’t incorporate technology into our lesson plans, we are doing our students a disservice. We, as educators, have been told for a while now that this generation of students are “digital natives.” They’ve haven’t been alive in a time when the internet didn’t exist. (Say what?) So, naturally, they’re better at technology than previous generations, right? Again, I argue the opposite. Today’s youth is really good at certain things in regards to technology. Think about the things that consume a large portion of their digital time. Social media and…yeah, social media. Generally speaking, this generation loves sharing statuses and pictures with their friends, and receiving instant feedback. What we have to keep in mind, is that they are 14-18 years old. This leaves a lot to be desired in problem solving, analytical, and decision making skills. (No offense if you’re 14-18 years old and reading this post. It’s just science. That frontal lobe of yours is still developing.) So, education now has to take on a new role of giving students these skills to not only survive, but thrive in a digital world. Employers today expect graduates to be proficient in a variety of medias. Where else are they going to learn how to turn out professional grade products using technology? And evaluate those products? And take feedback to then go make changes to those products? The answer is simple: at school. I came across an article that discusses the idea of the “digital native myth,” and a paragraph pretty much sums up how I feel about the topic. While clearly many young people are adept as digital consumers, their immersion in this world also heightens their susceptibility to the manipulations of advertisers, unless they’ve also acquired the critical and analytic skills needed to navigate our complex information landscape. And while today’s students certainly have a bigger menu of diversions before them than did their parents, entering the digital world as a creator and producer of content and mastering the tools to do so require a new and different skill set. We have to be the ones to teach students this “new and different” skill set. This goes beyond teachers using things like Google Forms to interpret student data (although that is a great use of Google Forms!! ), and into having students create Google Forms and have them analyze, interpret, and evaluate the data. Rather than giving students information and having them answer questions about the topic, we can utilize inquiry based learning and have students produce a product that demonstrates their learning. Now this is just one example, but is it easier to adapt certain content areas into a technology rich environment? Certainly. Does this look different for every teacher? Absolutely. Teaching is not a one size fits all profession. We don’t want to produce a “robot” teacher. But let me tell you this – if you give a technology tool to 5 teachers, I’d be willing to bet that you’d get 5 unique lesson plans incorporating that tool. Teacher autonomy and individuality does not go out the window when technology comes in. Nor is technology an “add on” to what we do. It should start becoming a part of how we think when we sit down with our lesson plans. Another reason to incorporate technology is because it adds an element of relevance to our lessons. As mentioned before, this generation of students has not been in a world without the internet. It’s part of their lives. If you can take your content and use technology to give it more relevance to students’ lives outside of school, and into the “real world”, you’re going to give them a deeper connection to your content. Earlier this week, Daisy Dyer Duerr posed the question in her blog, “Can JUST RELATIONSHIPS keep teachers relevant to students in the classroom?” First, I want to start off by saying that I’m having a difficult time thinking of a current classroom teacher who refuses to use technology on any level, so I do not have any teacher in mind when I answer this question. I’ll be answering in generalities. Ok, on to my answer. I think all teachers know that the relationships you build with students are the building blocks to a successful classroom. You simply cannot have an effective classroom if students do not feel valued. Think about the worst teacher you’ve ever had. Chances are that you probably didn’t even like this teacher, let alone learn much. I’m a firm believer that students learn more from teachers they like. They’re also willing to do more for teachers they like. So Daisy’s question was, are these great relationships enough to get meaningful learning in a classroom? My answer is no, it’s not enough, although it is a necessary ingredient. Many times, I like to relate things to sports. I played sports my entire childhood and through college. Having a coach that you love and respect as a human being is so important. There is a special bond between player and coach, but only when the coach allows it to happen. But is this bond enough to make the team successful? Of course not. The coach has to have an effective way to get her athletes to master the skills of that sport. Many times, a coach can be loved, but lacks in actual coaching ability. It doesn’t necessarily make the athletes love this coach less, but it does has an effect on the outcome of the athletes’ performance. Is this a stretch of a comparison to relevance in the classroom? Maybe. But I think the concepts are similar. Additionally, I can think of a handful teachers from elementary school through college that I loved as human beings and could talk to about almost anything, but I didn’t necessarily enjoy their class, and I didn’t necessarily learn a lot either. But I still really liked them. Now, back to my answer on this whole relationships vs relevance piece. In addition to “No, relationships are not enough,” my answer is also that technology does not stand alone as an “end all-be all” to add relevance and thus, to have a successful classroom. However, let me say, that technology is a fantastic way to tie the two worlds together. Technology is a tool, and should be utilized as such. Relevance and relationships walk hand in hand to creating an effective classroom. In just the way that relationships cannot stand alone to create an effective classroom, neither can relevance. Students won’t care about the relevance if they don’t think you care about them as individuals. We also cannot talk about relationships and relevance without mentioning the other “R” sibling – rigor. (Have you seen the new accreditation system for Kansas? You’d be wise to ensure your class has strong relationships, relevance and rigor.) With these three qualities, you will push students to do things they never thought possible, and I think that is a goal that every teacher possesses. It would be hard for me to talk about technology and not mention student engagement. I’ll keep this portion fairly short and to the point. If you had an opportunity to reach more students, would you? Technology offers us this opportunity. What you currently do, without technology, is probably great. But are there a few students you’re having a hard time reaching? Or who may just be going through the motions because they’re into the whole “compliance” concept? It’s just a thought, could technology integration be just what those students need to rejuvenate their engagement? Not to mention you could be hitting two birds with one stone – higher oder thinking skills and technology fluency – both of which are two skills employers today are looking for. This is what’s best for kids. Let me conclude with one last word: Balance. Please don’t be all technology all the time unless your content truly calls for it. Interpersonal skills are still extremely important, and they are also skills that employers are looking for today. Face to face interactions are vital for our students to have. Can they put technology down and have a professional interaction with an adult? Can they shake hands and look a stranger in the eye and have a solid conversation? Can they speak in front of a group of people? Can they use spoken word to elicit emotions from others? Can they get their point across without having to type it out first? We still need “people people.” We still need to teach students “soft skills.” These skills do not take a back seat to technology. These two world’s absolutely do NOT live in isolation of each other. Methods that could be considered “old school” do not have to be eradicated from classrooms today. In fact, there are times when those methods are the best and most appropriate methods to utilize. Please, continue to use these methods when this is the case. There are times where technology should absolutely be put away and not utilized. I really think that we can have our cake an eat it too. By this, I mean we can produce students who are well rounded in both interpersonal and digital skills, and I think it’s vital that we do just that. So I leave you with the one word I told you I was going to leave you with: Balance. Last week, I received an email from a former softball player of mine. She is in her senior year of college – her last semester before student teaching. She’s one of those kids that you knew was going to do something special with her life. A hard worker, a team player, a great attitude – I mean, you have to admit – this is the perfect recipe for a successful teacher. Anyway, back to the email. For one of her classes, she needed responses to a series of questions asking for advice for new teachers. Advice on the challenges of working in education today, advice on working with challenging students, advice on how to communicate with parents, etc. As I was typing the responses to her questions, I was inspired to write this post. If you’re reading this as a teacher in Kansas, this may apply more to you than if you teach in a state where the governor actually cares about appropriately funding public education. I digress – I will try not to bird walk too much in this post. Alas, now we begin my open letter to new and future teachers. Welcome to the most challenging, gut-wrenching, heart-pouring, amazing, rewarding, fantastic jobs known to mankind. You have chosen a profession that many don’t understand, yet try to judge constantly. We are in a sad place in public education right now. It’s becoming more difficult to retain teachers in the political and economical environment that our state has created, and the ones who have stayed feel like they take blow after blow from the statehouse. The work keeps getting bigger, more complicated, more technological, more… Common Core. And the pay keeps decreasing. And decreasing. Cuts are being made. Job security is a thing of the past. Programs are disappearing. Fees are increasing. Class sizes are maxed out. I could go on and on about the negative things happening in our state right now in regards to public education. But if you pay any kind of attention to the news, you knew this already. And you chose to teach anyway. I commend you for that, and I urge you, as time goes by – remember that. Remember what it was that made you want to teach anyway. Was it to make a difference? To spread your love of learning and of your content? Was it because you feel like you have a gift? The gift of teaching? Do you have this innate ability to create amazing lesson plans that you know will engage students from the minute they walk in, to the last second they are in your room? Was it because you absolutely love kids and you can’t imagine yourself doing anything else with your life? Hold on to that passion. Whatever it was that made you decide to take this crazy leap into this great profession. Hold it close. Guard it. Keep it near your heart. Live it every day. Because teaching is hard. Really, really hard. I think everyone in their first year or two of teaching asks themselves, “Is it worth it?” Most of us quickly shake that off, and might even feel a little ashamed for thinking that, because we know that yes, it is definitely worth it. The rest? Well, they either discover that teaching is not for them and they leave, or they keep on teaching without passion. My hope for the latter is that they find that passion, find that spark, and give it the ol’ college try. So what makes teaching today so difficult? Let’s start with the obvious. You know the saying, “I didn’t get into this profession for the money!” It’s true. And you know what? It’s hard being poor. My first year of teaching, I lived at home with Mom and Dad for a year. No bills, not rent, no nada. And I was still poor. (By the way, thanks Mom and Dad.) For whatever reason, I decided I would move out after a year. Retrospect is 20/20 – I should have ridden that gravy train for a lot longer. And boy – I thought I was poor while living at home?! Now I owned a house?! My husband and I – we know what it’s like to go paycheck to paycheck. It’s hard. What else makes being a teacher so difficult? Law makers. People who have never been an educator or a part of school finance are making decisions that are detrimental to the funding of our schools. This has a huge effect on 1) how much you get paid (see previous paragraph), 2) if you’ll be a “budget cut” next year (RIFs are no joke), 3) the resources you have available to you to use as you teach (yet you’re asked to prepare 21st century learners), and 4) programs that your school is able to offer students – both academic and extracurricular. Speaking of the importance of extracurriculars is probably better saved for another day. On top of those two glaring beasts staring you in the face as a teacher – you are tasked with managing day to day lessons, grading, planning, other responsibilities (there are a lot of these), learning, pressure, stress – your plate is full. (Yet you may try to squeeze in coaching one to three sports on the side.) Sometimes it feels like the waves are right below our nose, and it’s only a matter of time before we sink. So far, I have painted a pretty glum picture. (“Gee, thanks Megan. I wanted to be uplifted by reading your letter.”) But again, I go back to the fact that you already knew these things. But it was important that I address them because of what I’m about to say. Teaching is hard. Teach anyway. You’re going to be poor. Create a budget, and teach anyway. You’re going to have students, and maybe even entire classes that are a challenge. Always keep the students’ best interest a priority. Build positive relationships with each and every one of them, and teach anyway. You’re going to encounter parents that seem overwhelming. Keep in mind that you both want what’s best for their child, work together, and teach anyway. You’ll have administrators that you love. And some that you don’t feel so fondly for. Find a way to make it work, and teach anyway. You’ll have days where you feel like you did nothing right. Don’t worry. Learn from it and adjust. There’s always tomorrow. Teach anyway. You’ll feel like the demands of learning new techniques, technologies, and standards are going to overtake your sanity. Take a deep breath. You’re dedicated to being a life-long learner. Make a plan of action. And teach anyway. You will cry. Sometimes they are happy tears. Sometimes they are tears of frustration. Sometimes they are tears of heartbreak. You see, we teachers tend to share a heart with our kids. Just grab some Kleenex and teach anyway. Some days you may feel all alone. On these days, talk with a veteran teacher. They’ve been there. They know. They have great advice. They have great strategies. Listen to them, take their advice, and teach anyway. Some days you may feel all alone. On these days, don’t be afraid to be a trailblazer. Don’t be afraid to challenge the status quo. Be willing to take risks. You’ll know the difference between these times and the times in the previous paragraph. Find some courage to pursue your passion, and teach anyway. You’re going to have politicians who either intentionally or unintentionally try to strip your joy for what you do. Don’t give them that control over something you are passionate about and hold dear to your heart. Yes, you should absolutely advocate for yourself, teachers need a voice! But in the same breath, if you let that negativity fester inside of you, it will turn into the true monster that it really is. Take control over your passion, over your joy. Teach anyway. You see, it takes true grit to be a teacher. An unmatched courage and resolve to do what we love, even when faced with tough times. A resolve to provide an education to all students, regardless of zip code. A resolve to do more with less, and keep students a priority. For all the hardships mentioned above, immerse yourself in the positivity that surrounds you every single day. Show up with a true enthusiasm for what you do, look for the positives that happen in our schools every day, choose to smile, and you know what? I bet you’ll forget from time to time all of the negatives. Yes, acknowledge the negatives exist, yes, speak up when you’re being mistreated. I will caution you this- getting caught up in the negativity is easy, but getting caught up in the positivity is a heck of a lot more enjoyable. When you show up to teach every day, it is a choice. It is a choice that positively affects the students in your classroom. Be proud to call yourself a teacher. So, do you have grit? If so, I think you’ll make a fine teacher indeed, and I wish you all the best as you begin your wonderful career. If you have grit, teach anyway. Today I had my second Tech Tuesday. Well, it was actually a Tech Wednesday. Tuesday of this week was a disaster scheduling wise, so Wednesday it was. It doesn’t quite have the ring that “Tech Tuesday” does, but hey – I think I can let that go. Anyway, to keep it short and to the point, this week’s lesson was about getting the most out of Google Docs. It was not a lesson about Google Apps overall, but it was three mini-lessons about how to use Docs for more than word processing. Now, my disclaimer is this: Word processing is a good thing. It is a needed skill, and students need to know how to write a variety of texts, and write those on a computer. I’m not undermining the importance of that in the least. I spend a good portion of my days putting my word processing skills to use. The goal of the lesson today was to explore what else Docs can do for us – because there is a lot. With the collaborative features, and the ability to link up websites, articles, images, videos and more – you can turn a Doc into a really interactive experience. I hope you enjoy the lessons! If you’re a teacher, I hope you can find these mini lessons helpful! If you’re an administrator, I hope you can find these mini lessons helpful! 🙂 Feel free to comment below to let me know your thoughts! Have a fantastic day! P.S. How about this short and sweet post?! It’s a miracle! Our lives are crazy busy. “Our” could metaphorically represent anyone reading this blog post, but I’m literally talking about my husband and me. Our lives. So busy. All. The. Time. It’s the nature of my job – lots of nights working and supervising events and activities, with an occasional school event on a weekend thrown into the mix. Going out of town for conferences. Staying late for meetings. Completing your daily “to do” list at home. I’m not complaining – I absolutely love my job – I hope that is evident – but it’s a simple truth that comes along with the territory of a school administrator. To compound the craziness just a bit, my husband works for a major retailer. If you know what retail hours are like, you feel our pain. Late nights and weekends galore. Did I mention that I also give pitching lessons anywhere between 4-6 times a month? Throw a social life into the mix (haha) and a two and a half year old, and you could say our days (and nights) stay “fairly” busy. We have fortunately been blessed with the most amazing family. Ever. My parents (whom we will call GG and Gramps) and my husband’s parents (whom we will call Mimi and Grandad) are a true blessing that I cannot even begin expressing enough gratitude towards. I say blessing because I know that not every family’s dynamic works the way that ours does, and I’m incredibly thankful for what we have. In addition to saving our tails when we need someone to watch our daughter, I love how much our parents love her. Knowing that she has a special relationship with each of her four grandparents is such a remarkable gift, which I hope she one day realizes. She’s too young at this point in her life to have these memories when she’s older, but I hope she remembers how much fun she had when Mimi would give her a treasure, or come spend the day with her every other Friday, and go on adventures rather than go to daycare. I hope she remembers how Grandad lit up every time he saw her and made her feel like she was the most important thing on earth. I hope she remembers all the walks and wagon rides with Gramps, not to mention the countless trips to Culver’s to get a kids meal with ice cream! I hope she remembers Sundays with GG, and all the love that got poured into meals followed by playtime, bath time, dessert, and lots of hugs and kisses. I hope she remembers the countless fun sleepovers she had at both sets of grandparents’ houses. Those memories are forever in my heart, and they are such special times for our family. When I think of grandparents, I not only have the gift of knowing this life with amazing grandparents for our daughter, but I also remember my own childhood with four wonderful, loving grandparents. These memories are filled with nostalgia, love, and happiness, and they usually come with some belly laughs when reminisced upon with my brother and cousins. The bottom line was that we loved being with our grandparents, and if I could go back in time to have some of those moments back, I would in a heartbeat. It seems only appropriate that I post this on National Grandparents’ Day. (But I will be completely honest, I had no idea it was Grandparents’ Day until two minutes ago when I took a quick Facebook break and saw posts about grandkids getting their grandparents gifts. It was a 100% coincidence that I wrote this post today. So, um.. err.. this is awkward. Sorry Mimi, Grandad, GG and Gramps. No Grandparents’ Day card or gift for you. Are you really surprised though? No, probably not.) At any rate, this post is dedicated to all of the grandparents out there, especially my grandparents, my husband’s grandparents, my parents and my in-laws. Thank you for being such fun, positive, loving influences in our lives, and for never stopping your unconditional love as a parent. We love you. We thank you. We adore you. One of my goals for this school year is to provide differentiated, meaningful professional development to teachers in our building. For those of you who have been charged with PD implementation in your respective buildings or districts know that this is no easy task. However, I’m passionate that professional learning should have relevance to teachers, so I aim to provide them with relevant topics and ideas for professional development. You may have read my post on how we are allowing teachers to participate in Twitter chats for PD points. That is just one path on my adventure to personalize PD this year. This year, we decided to restructure that PD time. Those days once a month are going to be used for teacher collaboration, and we will not interfere with that time. However, technology is an initiative we feel is important for our school to continue to progress and stay relevant to students and stakeholders. So where does that put us for technology professional development? Enter Tech Tuesdays. Twice a month, I will put together a PD “menu” so to speak, for teachers to come pick and choose what tech tools they want to learn about. I set up shop before school, stay in the library all day, and stay after school to try to meet the convenience needs of as many teachers as possible. Oh – and did I mention this is optional? We want to support and encourage teachers who want to take risks and try new things by providing them with ideas and resources. But if you don’t want to come play, I’m not going to make you. So today was our first Tech Tuesday of the year. I set up in the library conference room, a little nervous, a lot excited. After all, I had spent probably close to 15 hours researching, making decisions and choices, creating video, curating content, and putting it all into a neat little package. This was a “Labor of Love” that I was really excited to share with staff. I decided to make today’s Tech Tuesday all about Google Apps for Education (GAFE). Our district is a GAFE district, so why not spend time investigating ideas of how to better incorporate this FREE resource that is available to us? So, I put together the first in a series of GAFE Tech Tuesdays. When teachers came to see me, I first shared with them this Google Doc. This Google Doc was a “table of contents” more or less that contained links to the three different lessons I had created for the day. Teachers could do all three lessons if they wanted to, or they could pick and choose the one(s) they felt were most relevant to them. The second lesson option demonstrates how to use the “Go To Page Based On Answer” feature in Google Forms to differentiate instruction for students. Using this feature, teachers can create a Form that is responsive to the answers that students submit, and take them to various pages within the Form based on their answers. For example, if a teacher has a multiple choice question on a formative assessment, and the student answered it wrong, based on that wrong answer, the Form would direct them to a review page rather than the next question. When they finish the review page, they can try to answer the missed question again, and when they do answer it correctly, they can then move on to the next question. Pretty neat stuff. I’d like to give a quick shoutout to my PLN on Twitter for providing me with a vast majority of the resources found in those Google Docs. I tried as hard as I could to give credit where it was due throughout the lessons – please do not think by any means that I created all of the resources within these lessons. Curated – yes. Created – no. A BIG shout out to the makers of HyperDocs who helped me with the organization of my lessons for Tech Tuesdays. It will be a really seamless way for teachers to access the lessons, especially when I put them in my Tech Tuesday Google Classroom. I want to sincerely thank the teachers who came to Tech Tuesday today. I so appreciate you dedicating your time today to some professional learning. My attendance rate today was not through the roof – but it was a good starting point. I received some good feedback from the teachers who attended, so I will continue to try to build and improve upon what I have started for future sessions. If you have any suggestions, feedback, comments, etc., please comment below, or contact me via Twitter, @MeganBlackEHS. If you are a school leader, I hope you can find something useful to share with staff. If you are a teacher, I hope you can find something that speaks to you to use in your classroom. Thank you for taking the time to read through my post! Stay tuned for the next Tech Tuesday in a couple of weeks! Have a fantastic day. Well, we just wrapped up the first full week of school. It’s Friday night, about quarter ’till ten, and I’m just sitting down to decompress. And wow, there is so much to decompress from. What a whirlwind the past 8 days have been. Last time we met, I couldn’t sleep because I was so anxious about the first day of school, so I shared our Twitter for PD Policy we’re piloting in our district. That blog post seems like a lifetime ago! This past week or so has had it’s fill of ups and downs like any week in the life of an educator and parent, but overall, the outlook for the year is bright. First, I’ll try to (as briefly as I can manage) describe to you how our first half day of school went. This was a day for freshmen and new students to the building. I asked my principal in the spring if I could be in charge of the first day of school and make it my baby. He graciously allowed me to do so, and I had the passion and purpose (those two are a dangerous combination) to make it a fun, meaningful, successful day for our students. The planning that went in to this day was tremendous, but it was nothing compared to the way our school came together and truly put on a show. There were teachers over the summer preparing materials, contacting students, and choreographing and rehearsing performances. I had a group of about 25 upperclassmen who gave up two days out of their summer to come train with me to get ready for the big day. I had volunteers who helped me set up for the day, and they did so willingly and with a smile on their face. I’ve told you before, and I’ll probably tell you again – our school is a great place to be. I cannot tell you how much I appreciate the wonderful dispositions of the people at our school. Anyway, the whole idea of the day was to start these new students’ year off on a positive note. But, I didn’t want it to stop there. I wanted them to feel on that first day. I wanted them to feel what it was like to get involved. I wanted them to feel the power of our pep band. I wanted them to feel what a spectacular a cappella National Anthem from our choir sounds like. I wanted them to feel like family as they learned the alma mater and fight song. I wanted them to feel unity as they learned the “freshmen” cheer for pep assemblies. I wanted them to feel as though they belonged during their small group sessions with their group leaders. I wanted them to feel like they could have a successful school year with a few good decisions. I wanted them to feel…like a Cardinal. Was this achieved? I can’t speak for each individual student, but I’d like to think we came close. So for those of you who had a hand in making this day special, I thank you from the bottom of my heart. It was one of the most stressful, fun, and gratifying things I have been a part of. The weekend soon followed our back to school bash, and starting Monday, school was in full force. I was able to relax a bit, as our inservice days and first days of school were complete, but it wasn’t long before I was right back into the groove of my “usual” routine (or as routine as we can get) of tackling our next PD days, organizing Tech Tuesdays, completing teacher evaluation tasks, organizing meetings, getting into classrooms – the works. And now that I think about it, although my blog from last week seems so long ago, I also feel like this week flew by. At any rate, last week, I wrote about our Twitter PD opportunities in our district, and this week, I was delighted to see teachers start to take advantage of them. I saw at least three teachers start to interact with other educators, and participate in chats on Twitter. Conversations that I had with these teachers afterwards only affirmed that what we’re doing is the right thing. Each teacher had gained resources, ideas, and a network of people to collaborate with in the future. But what I loved hearing most of all, was that those teachers had fun doing this. That brought me so much joy, and I can only hope it’s a positive sign for what’s to come throughout the year for learning via Twitter (and heck, learning in general). As I mentioned earlier, the week had both ups and downs. In the midst of the sad times that can oftentimes come along with the job of an educator, there’s always something that brings joy back into my heart. Tonight, I hugged my baby girl a little tighter, gave her a few extra kisses, and shed two tears as we said our prayers before she went to sleep. There’s no way I deserve all I have been blessed with in life thus far, but each night I will continue to pray prayers of thanks.